Rawstudio should not dictate a certain place where you store your images. You should be able to move your images around outside Rawstudio and still keep your settings. You should be able to move your images from one computer to the next without losing your adjustments. It should be possible to work on a shared image folder from multiple computers. You should be able to work with images on read-only media (CD/DVD). So to accommodate this, we most importantly choose that your settings are stored alongside your images, and not in a central database. This gives us the most flexibility in and satisfies most of the points above, but of course this still presents some challenges. I will go into specifics below. A cache of the metadata read from the files. Your settings made to the image. A thumbnail for the iconview. When you move your images around, the folder and its content should be moved along with it. As long as you do that your settings for the images will be retained. This enables a feature that you may find very helpful. It you have a reasonable fast card reader, it will enable you to work on the images on your flash card. That means, you can put the Flash card in your reader, and look and work on the images there – no need to transfer them first. You can then pop the card right back into the camera, and keep shooting – and when you are done, you can still copy your images to your computer, and your settings will still be there (if you copied the settings folder along, of course). Here we have enable “Show hidden files” to see the “.rawstudio” folder. Read-only media of course presents a different challenge. When Rawstudio discovers that it cannot create a folders for its settings, it will instead store your metadata in the “.rawstudio” in your home directory. More specific in a subfolder called “read-only-cache”, with each image being identified from an MD5 of 1KB of the centre of the image file. So basically, if you move your photos, move the entire folder so the “.rawstudio” folder, or remember to copy it along if you are moving single images. Then your settings will be preserved. Tagging is a bit different compared to image settings, since we want to be able to search through them. For tags we primarily employ a single database, that contain images, their complete path and their tags. Of course this presents its fair bit of problems, so to be able to maintain the flexibility we set out for above. So to maintain this, we also store a backup of your tags alongside the images. This is stored in a single xml file, which will be read back whenever you open a directory. This will re-add your tags, if you moved the directory or open it on another computer. When you search your tags we then sort out the files that doesn’t exists any longer, and simply skips them. So if you for one reason or another have lost your tag database (btw, called library.db in home/user/.rawstudio), just re-open your image folders to re-add them. You can of course use the “Open Recursive” feature, though it may take a while depending on your image library size. General settings for your application are stored the the gconf database. These are mostly UI settings, and pretty easy to set up on a new system, so losing them shouldn’t be a big deal. 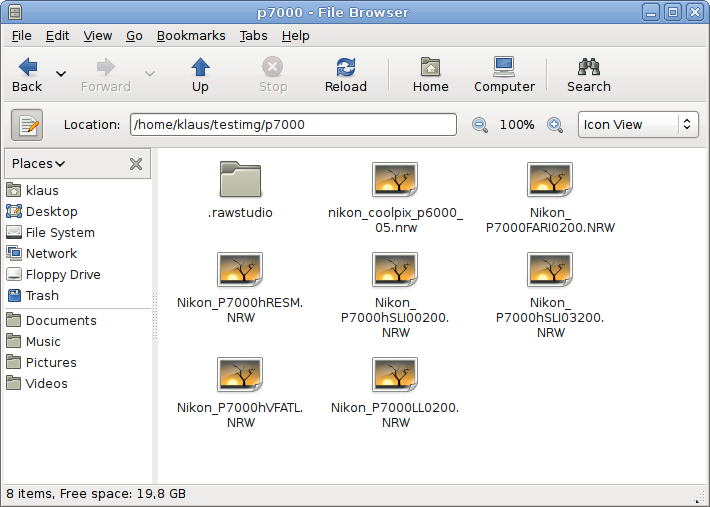 Lens selection information and camera default settings are stored in the “.rawstudio” in your home folder. These can be transferred to a new system if these selections are very useful for you. I’d prefer the ro-behavior even on rw-media. If I want to store the data side by side with the images, to give it to a friend, I could export it as a “project file” (which could be a zip containing all the relevant data, for example). If I copy or move files (not folders), the hidden dotdirectory won’t be selected and thus ommited. Its better to have one central place where all your information for rawstudio is kept: home/user/.rawstudio, and not spreaded all over my filesystems and NAS. I disagree with Joe. Having the settings stored alongside the images means my Rawstudio data will be backed up alongside my regular photo backups. If I restore a folder of photos from my backups I also get the rawstudio settings. Anders, well, yes, it’s good to hear you can configure the behavior you prefer. Simon, I can’t follow your point. First, you should backup your homedirectory, too, or at least its possible to backup your .rawstudio dir in your homefolder. Or you can place your central .rawstudio-directory somewhere where it will be backuped. From a “general” user perspective, it is far easier to know that if you backup your raw files, your settings are also backed up. So if you attach your backup HD to any computer, you will always get the settings, without having to fiddle with individual files in the home directory. It is not like we are spraying your HD with unneeded data. It will only be in directories you’ve opened, and which contain raw files. I am just offering a different p.o.v. to consider. There are different philosophies about this topic, and I think you can’t say one is “the true one” or a completely false one. More likely every approach has its own advantages and disadvantages. It’s not that I don’t see the advantages of your approach, but for me the disadvantages count more. So from my point of view, if you’re able to store 6 year photo archive on your NAS, you should have enough capacity and inodes to store couple of .dotdirs along – even with default FS settings. 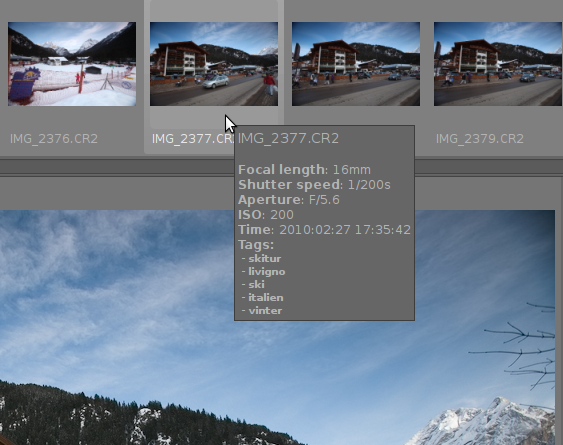 I really like the ability to edit and access the same photo archive from multiple computers, and I really think, that this is absolutely worth couple of inodes and megabytes. 1+ to Joe’s point of view. Take the Apple’s Finder for example. I have to spend some time tiding up the mess that it does whenever i open up a folder, creating all sorts of .DS_Store and even those incredible ._.DS_Store files. It’s really disgusting. As said to Joe, select “place cache in home directory” in preferences. Hello! Rawstudio is just a wonderful piece of software, thanks for developing it! I have a question, tho: I can add tags to pictures, but is there an easy way to un-tag a previously tagged picture? As well, will rawstudio read tags from other softwares as shotwell, etc?